Sting's critically-acclaimed Back to Bass tour will stop in Manila, Philippines on December 9 at the Mall of Asia Arena and in Jakarta, Indonesia on December 15 at the Mata Elang International Stadium! Performing his most celebrated hits, Sting will be joined for both concerts by a 5-piece band featuring Dominic Miller (guitar), Vinnie Colaiuta (drums), David Sancious (keyboards), Peter Tickell (electric fiddle) and Jo Lawry (vocals). Tickets for the Manila performance will be available beginning Friday, September 21 at 12NOON local time. Tickets for the Jakarta concert will be available exclusively to Sting.com Fan Club members beginning Wednesday, September 26 at 10AM (local time). Tickets will go on sale to the public on Friday, September 28 at 3PM (local time) at the Hard Rock Café in Plaza Indonesia Mall, and will be available for purchase online beginning Saturday, September 29 at 10AM (local time). 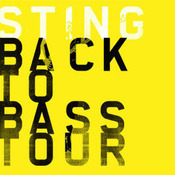 Stay tuned to Sting.com over the coming weeks, as the final dates for the Back to Bass Fall Tour 2012 will soon be announced! I'm sooo excited!! It will be my big dream come true and it's AWESOME!! See you on December 15th in Jakarta... Yeeepeeeeee!!! Hope you'll have some time for a meet & greet session in the Philippines for us to have your autograph. It would be great for my "Lyrics by Sting" book and my "Fields of Gold" CD be signed by you. The link and the presale are both working fine. Got my ticket for the concert. Yeaaah!!! Can't wait for it.. Tried to click the 'Ticket' link for Jakarta, but myticket.co.id does not sell the presale tickets. Is the presale cancelled? Tried to buy presale tickets for Jakarta but there are no links to buy. Is the pre-sale cancelled? Yes Jakarta Pre-Sale now working. 4 VIP tix you beauty! !Terima Kasih. The Jakarta presale is working fine. Mr.Sting, looking forward to welcome and seeing your performance in Jakarta! I am your biggest fans! It would be a dream come true for me enjoying your live show soon..can't wait.. It will be great performance, before Ten Summoner's Tales Tour was performed at February 1994 in Indonesia. We'll waiting you Sting !!! I'm surprised when my brother informed me about his upcoming concert...wish he could sign his autograph on My "Sting at the Movies" CD. The first CD I bought when I started working. I hope to find the album "All this time" too. Just moved from California to Manila and my wife said Sting will be here! I'v been listening to The Police and followed Sting since I was 8 years old and never been to a concert. I'm sooooo there! Mercury falling... Ten Summoners Tale... Now Back to Bass.. Third time in Manila... I'm excited to all pinoys, this will be the concert of the year for sure. I'm just sad I cant watch it with my pinoy friends, I live here now in LA but seen back to bass in LA and Vegas last year. Mabuhay Sting !!! Finally...... Cant wait you come here to Jakarta this Dec. So exciteeed....!